At Sand Point Beach Park, stormwater from 82 acres of land is funneled through the park before it enters Lower Prior Lake. Stormwater runoff picks up excess nutrients, such as phosphorus, on its way to Prior Lake. This excess phosphorus can contribute to summer algal blooms. 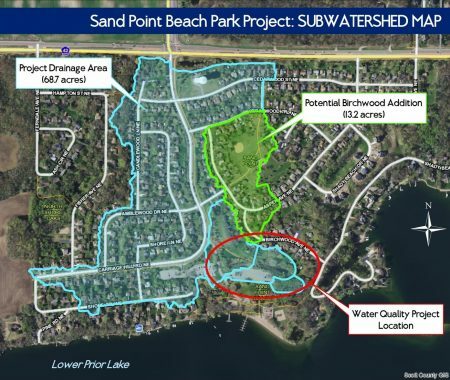 As a result of these improvements, the project will reduce the amount of phosphorus entering Prior Lake from Sand Point Beach Park by 24 pounds per year. One pound of phosphorus can produce from 300 to 500 pounds of algae, so this project could reduce the amount of algae in Lower Prior Lake by as much as 12,000 pounds! The Lower Prior Lake Protection Project is focused on keeping Lower Prior Lake off of the MPCA’s list of impaired waters by installing best management practices in the watershed to treat stormwater before it reaches the lake. Although Lower Prior Lake currently meets water quality standards, degraded water quality is of a concern in late summer when algae blooms become prevalent and the lake has the potential to degrade over time due to continued untreated stormwater coming into the lake. The project at Sand Point Beach Park Pond Improvements Project is one of several projects that are part of the Lower Prior Lake Protection Project. Other projects include: wetland enhancement, iron-enhanced sand filter and prairie planting at Fish Point Park; bio-infiltration basins at Indian Ridge Park and Fairlawn Shores; and a shoreline restoration at Watzl’s Beach. For more information about the Lower Prior Lake Protection Project visit the project page. February – May 2018: Construction underway. Trees and shrubs around the two pond basins, the trail, and along the slope towards Lower Prior Lake will be removed so that construction for the project can be started. The two ponds will be excavated to remove accumulated soils and to expand the basins to retain additional water. An iron-enhanced sand filter will be added to the south of the second pond, built into the hillside at the park. The eastern pond will connect to the iron-enhanced sand filter by a new outlet structure. Clean water will then be routed back to Lower Prior Lake through a connection to an existing pipe. Some of the disturbed areas on the hillsides of the project will be seeded with native prairie species. May – June 2018: Planting replacement trees and shrubs along the trail coming in from Birchwood Avenue. Fall 2018: Enhancement planting in prairie areas with native grass and flowering species. June 2018 – ongoing: The newly restored areas planted with native seed will be maintained by a variety of management methods including mowing, hand-pulling invasive weeds and treating them with herbicide, and enhancement planting with native species. The water levels in the basins and the iron-enhanced sand filter will be manipulated with controls and maintained to ensure the system functions properly. Funding for this project was provided in part by the Minnesota Pollution Control Agency through a grant from the State’s Clean Water Partnership Grant Fund, along with major contributions from the City of Prior Lake and additional contributions from PLSLWD.